If you walked down Bay Ave to the Farmer’s Market you probably noticed this in the building on Bay Ave between Waterwitch and Huddy. The last thing we need in Highlands is more transient housing. “Luxury” apartments become “run down” apartments in no time. We need more full time residents with a vested interest in maintaining their property. This would mean only one absentee landlord. I would much rather have a hardware store on that corner than luxury apartments. People who go for luxury rentals or purchases want services and Highlands doesn’t have them so these people will spend their money elsewhere. If only the Highlands government would actively pursue businesses to attract the money that our mayor seems to desire and give those residents who have come back a decrease in our tax burden, then those affluent people will follow. Or, they may bring the town up and spend a lot of money dining here. Our government AND the HBP need to actively pursue ANYONE that wants to do business in this town. I’m hearing that Penelope (the clothing peddler) is being given a hard time and being told that this is not what Highlands wants. I’m angry that one person thinks they can speak for the entire town. As one resident, I want ANYONE willing to come to this town to be able to do business. Especially those that jump through all our hoops and red tape and is in business legally. We should be welcoming all peddlers to Highlands in hopes that the more successful ones see that having a business in this town *is* viable and maybe, just maybe, they’ll be willing to open in one of our vacant store fronts. After the past couple of weeks I’m beginning to think the HBP should be renamed the HABP: Highlands Anti-Business Partnership. Who says that’s not what the town wants? Looks like the town was liking her to me! I just ran into Penelope this weekend at the farmers market. She had great merchandise and priced well! I’d rather shop locally than go to mall, grove, etc. Good news! The council is looking into increasing the number of peddlers licenses available in town. I can’t way to see what comes next! I think a hardware store is a great idea. Also understand that with luxury living services are wanted. Perhaps this is a way to get more like minded people working to make a change. Will these be rentals or condos? it says retail space 4 luxury apartments. Maybe it would be a good idea to look into this. Take a look across the street on bay Ave and all you see is a vacant lot and what i think are old army barracks. What looks better? If some body wants to invest in this town( taxes) why not let them? I hope that the get cool retail and maybe that means there is a plan for the old Penta’s apartments. (army barracks). I think it would be great idea to build an indoor/outdoor flee market(like tents in Union Square) on that lot of land.It would bring in unique artisans that people might draw people to Highlands. Maybe have talent on weekends even in winter. For those not familiar with Union Square Holiday Tent market(something like this. You pretty much know the answer – NEW people. With money. BAD!!!! The issue for this project is that they are providing no parking. 6 residential units would need 12 parking spaces, plus spaces for the businesses. It is a very intensive development for the location. How will the cafe feel with the curb spaces occupied overnight by residential parking. The new restaurant isn’t going to like parking alongside their building. Highlands Blog: Conduct a survey of the businesses already established see how they feel about the parking. The building does look nice and its within existing uses. Nobody denies that. But this is why open dialogue is very important. “Parking” is the hold up. Good to know now we can work on a solution. By the council shrugging and putting it off on zoning like they no nothing is more than irritating. The owners of the lots across the street are paying taxes on land that isn’t being used and from what I can tell hasn’t had anything thing there for 20 years. If *someone* talked to them and had them turn it into Parking, they could rent out one lot to the “new building” and one to the town. At a minimum they would make money to pay the tax outlay they already incur. And if that’s not an option, there are many other smart people in town that might be able to figure out something. – It all starts with dialogue and transparency. Also it would be good to know, how the existing building handled parking. Especially when it was a hardware store and had active tenants. The hardware store and its 2 residential rentals existed for a long time. Probably were “grandfathered” into zoning, certainly didn’t represent an intensive use, therefore never really presented problems, except with the 42 cats in one apartment!! The points you raise about the empty lots are valid, but the town could never “initiate” the discussions, they only could be in a position of approving something. It really would be in the applicant’s best interests to work out how he is handling the parking issue, such as agreements with owners of the empty lots, before he comes before the ZB. It is unfortunate, IMHO, that the applicant has an application in front of the zoning board (because of the variances he needs). The ZB can only rule on his application, as presented, yes or no. If he went to the PB, they can negotiate with the applicant, maybe reduce the intensity, and come to an agreement. ZB really can’t do that. Ok, a few questions, a) I’ve seen 4 apartments and 6 apartments, how do I get the real number? b) Is the next step with this guy the zoning or planing board? and when are they meeting so I can get the businesses in that area to show up and support him c) Parking who’s issue is this really? ZB, PB, Council, HBP? I would hope that parking is everyone’s issue. First, I would see if the the developer can get the land owners to lease it to him as parking. I would assume it would be private parking and that his cost to lease the land would be built into the rent he charges his tenants. Second, we have to find out if those lots are zoned for parking. It seems silly to type that, but this is Highlands and stuff like this seems to happen quite often. This is where everyone else comes in: zoning, planning, and council. If this is not zoned for parking lots then what needs to happen to change that? A zoning variance? A change in the zoning ordinance? As for the town using a parcel for municipal parking, we just can’t afford it at this point. There is parking next to Havana and parking next to the skate park and plenty of parking around the park. People will just have to get used to walking a little more. If using those vacant lots for parking is a no-go and there is a concern of new residents using Waterwitch for parking, then maybe we make the parking on Waterwitch between Shore and Bay 10 minutes only. This gives the businesses the short term parking they need and while still leaving residents plenty of space to park on the streets. Applicant is scheduled for next ZB meeting, 9/4. He’s asking for 6 apartments and 3 commercial spaces on ground floor. Parking is a zoning requirement, he needs to provide 15 for residential +11 for business, he needs variances for density: an extra floor for residential, only one allowed; 4 apts less than min req. 1000sf; various other bulk variances. I’ll be surprised if the other businesses are ok with project. Maybe the café is ok, but not flower shop or Kranky. Maybe you should talk to the other business owners before you speak on their behalf. You know what they say about “assuming”. Nolongernew comments are right on. The Penta property is not zoned for parking lot. No where on Bay is zoned for parking lot. It is a singularly unattractive use for such a prominent location. Technically, the project’s residents could use town parking by Havana, but experience tells me that they’ll fill up Waterwich/Bay first. And those spots need to be reserved for commercial uses. Restricting parking around the site to 2 hrs max, no overnight, ala AH first Ave, could work, but applicant needs to approach town and start dialog. I doubt he’d be able to get approval subject to the town making the change in parking unless the town gets on board and makes that known to the ZB. From my point of view, this is a role the HBP should play, to advocate for new businesses, help them navigate the ZB/PB processes. Our HBP doesn’t do this. Perhaps the developer would consider purchasing boarded up building next door on Bay , knock it down to create parking with a decorative fence up on Bay and entrance on Huddy? That would work but obviously both parties would need to work out a reasonable deal. Or landscaping on Bay instead of fence so parking is not visable from Bay as they did near condos by Seastreak so they are not facing parking lot? Claddah and Chilango both have lots that are open. Are they grandfathered in? What would be the definition of grandfathered parking whether it be business or residential? Is there a specific ordinance that pertains to this? all on Bay Ave. How can Bay Ave NOT be zoned for parking lots. Everyone is making good suggestions, but the applicant needs to understand that he has to supply the answers to the ZB. I hope his attorney is experienced and will not let the applicant appear before the ZB without solid answers. “I plan on approaching the property owner across the street and see if I can use his property” will not satisfy the ZB needs. A contract/agreement with that property owner will satisfy the ZB. Carolyn: Both those businesses own the parking areas, so the whole property is a business use, including parking, which would be an accessory use. I think the prohibition applies to a business doing parking only use, not to the accessory use as is the case for Chilango’s and Claddagh. I do have to hedge my comments a little though. I couldn’t find the no parking lot on Bay Ave in our ordinances. I’m still looking. Also, the town could waive the parking requirements for the BUSINESS component of the project, IF the applicant can prove sufficient municipal parking within 1000 ft of his project. Not sure how far is the Havana lot from him. There is no getting around the residential parking requirement, though. Wow …. back to the ‘You-can’t-get-there-from-here’ disease in Highlands! I am still stuck on the 15 parking spaces for 6 apartments? Isn’t the requirement 2 per residential – giving you 12? As to parking … as highlansblog replied there is a municipal parking lot 1/2 block away. New parking signs and time limits make a lot of sense … but that’s controlled by the town and not by any business or property owner. 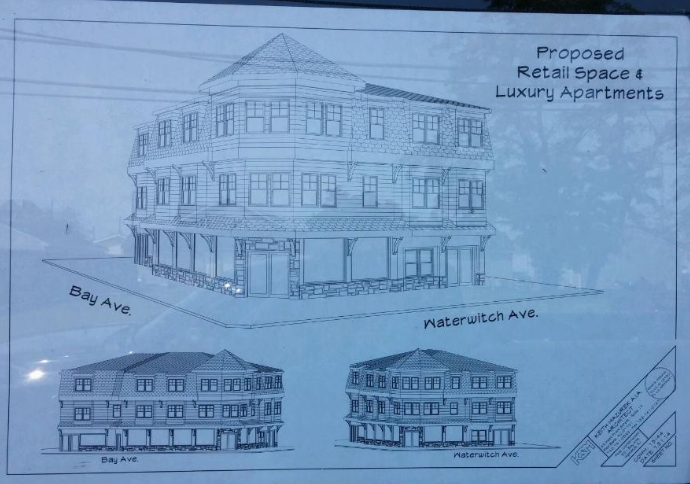 Why would businesses on Waterwitch be opposed to more retail???? Wouldn’t that increase their draw of potential customers as other businesses begin to successfully operate? And isn’t this developer already the landlord of Kranky’s? As a successful business I would be glad knowing that there are additional retail units right next to my current location that I could entertain expanding to …. and get this! The same landlord!… not many businesses can expand leased space without moving their location. I’m dumbfounded that all the proper solutions for a better Highlands is now on a property owner to initiate – just so the town can address and correct all the zoning and master plan elements that has kept Highlands as an abandoned blight area. THE ABOVE POST WAS MADE BY ME, BARBARA IANNUCCI …. AND NOT BY DOUG CARD. WE SHARE THE SAME SYSTEM AND I CLICKED POST BEFORE CHECKING MY LOGIN NAME. Chris what is your problem? Why are you so against new development ? The builder does not need the PB. He is working with the ZB for what he needs and for what would be best for the town. His lawyer is outstanding and understands the facts so that everyone will win.